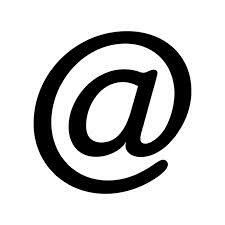 The theory of how the image ‘@’ came into being is passing through cyberspace, again, these days. We all know that monks of all types, Benedictines, Cistercians, Augustinians, etc., had much to do with culture. This is particularly true, I believe with the Benedictine and Cistercian monks who worked out tools for writing but also useful things for art, cooking, gardening and beer making to name just a few ideas. What was helpful and labor-saving in the monastery had applications for the rest of the world. Here is a 2009 story on @ found at Wired. Just the other day the Huffington Post published this note about the ubiquitous @. The point is not raise your awareness about the history of the @. It is to help you recall that things don’t fall out of the sky on to your plate, or your computer screen. A real person has had to dream and work out the tool used. Our intellectual and religious history needs to be recalled and honored. Much of the world that uses email has to use ‘@’ to send a message. Next time you do, pray for the Benedictines.